This piece was commissioned by a magazine to illustrate one of those "how they goofed/will they survive" articles which people dearly love to write about Apple Computer. The art director wanted some apples to be gnawed away by worms as the article progressed and grew increasingly depressing. To obtain a good visual reference, a spade was employed to dig up a few worms. Said worms were then plopped in an acrylic box on top of a flatbed scanner so that their colors and texture might be captured. Alas, worms really don't care for light. The scanner in question was a triple pass, making separate trips to scan the red, green, and blue channels. In between each pass, the worms thrashed like crazy. The end result was a psychedelic-looking image of red, blue, and green worms wiggling around. Quite colorful, but not particularly helpful. With the deadline rapidly bearing down, an unappetizing-looking worm texture was hastily simulated with a pink and grey noise map, then made kind of glossy to simulate slime. To obtain the apple texture, a real apple was sliced open and scanned repeatedly over several hours as it grew more and more oxidized. Here's another image in the series, showing the grotty apple. 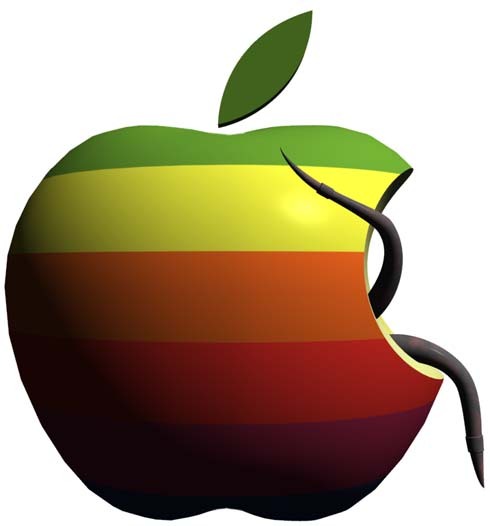 It's odd how the worms' delicate nibbling has caused gigantic chomps in the apple. Such is the power of hindsight!